blueprint news: UFOs over China ? Shennongjia apparently not understanding the position of flying objects. - Meteorologists don't have explanation. 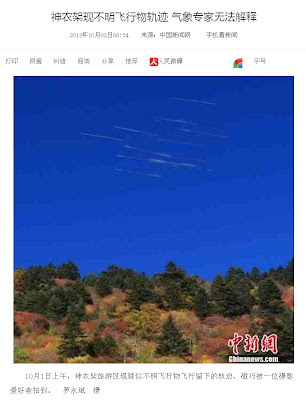 Yesterday, 1st October, 2012, unknown flying objects have been detected in the sky over Shennongjia holiday resort in Hubei province. Some 12 flight trajectories (i.e. vapour trails) have been observed and photographs have been taken by a Chinese citizen whom the Chinese source named a "patriot". 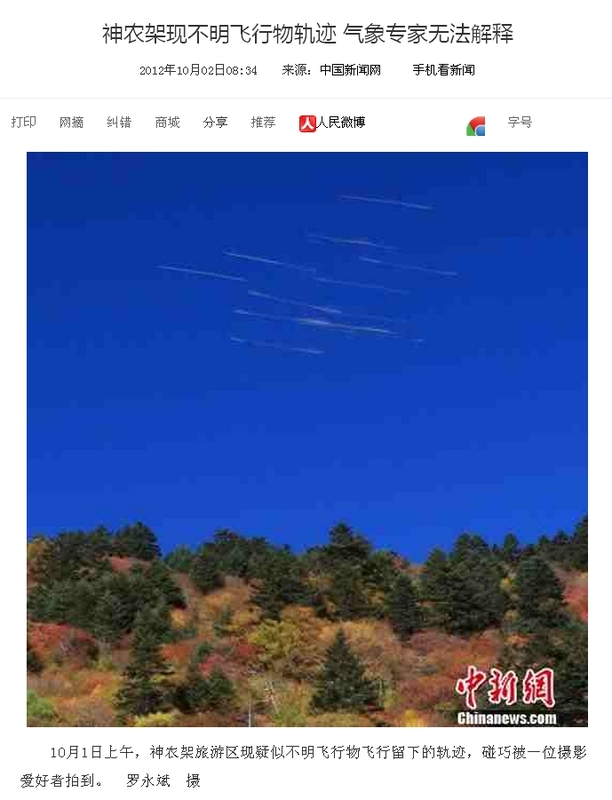 As nobody seems to know the origin of those 12 trajectories running parallel in the morning sky at Shennongjia, I tried to find out something more by choosing one of them that could be easily measured on a Chinese photo. A reference object (tree) from the photo was chosen for the calculation of the real length of that trajectory at an assumed heigth of 10.000 m. If there were more than one photos taken in a short period of time, it should be possible to determine those parts of vapour trails that are changing within a certain time. Thereafter, a calculation of the flying objects' speed should be possible. Even though the time of exposure for the camera was reported (1/13 second) this should not be enough for the purpose. Tree: 2.8 units of length => 2.8 [m] assumed height of tree, taken as a length reference for the following calculations. Virtual object: 0.7 units of length => 0.7 [m] that could be interpreted as a flight trajectory with a real length of about 12 km. Inaccuracy accepted for the assumptions used in the above calculation, it seems realistic that so many objects, flying in the same direction, could be interpreted as different missiles at supersonic speed. Most probably, these are disabled medium-range ballistic missiles or parts of them, either used for a demonstration of military strength or for a test of China's missile warning system by some interested party. Therefore, nothing to worry about. Same thing happened during a Russian missile test when luminous traces of disabled rockets could be observed in the nightly sky over Israel and Syria. I included that story in one of my recent blogspots as some kind of "political omen". Postcard from the Cataracts of Iguacu in Parana, Brazil.